The prolonged life of the Local Organising Committee (LOC) is no fault of its own, but a confluence of circumstances, as there are some residual issues still to be taken care of. âWe have been assured by the contractors Sea Operations that the remaining work would be completed by January 15, give or take two weeks. I cannot see us going beyond the end of January,â Findlay said. The LOC was charged with the responsibility of providing two upgraded practice venues, the Sion Hill and Stubbs Playing Fields and the match venue, the main Arnos Vale Playing Field, as well as other support structures, to stage official warm up matches, ahead of the Cricket World Cup last year. St. Vincent and the Grenadines hosted Australia, England, Bermuda and Zimbabwe from March 2 to 10, for four matches. Findlay said that most of the work has been completed; however, there remained some work to be done on the double decker stand, located at the south eastern side of the main Arnos Vale Playing Field. âAs you can see there is still some work to be done on the double deckerâ, Findlay said. Findlayâs claim was confirmed by Construction Consultant Deirdre Myers, who told SEARCHLIGHT that the painting of that stand was the major work left to be completed. 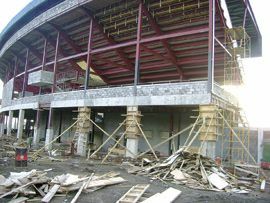 The largest of the buildings in the facility, that stand was also a sore point two months before the matches last March, as the LOC had to get it event ready, as there were some reported lapses by the previous contractors..
Findlay admitted that some of the hiccups were some man made, while others were natural. âThere were some contractual delays, as well as severe damage done to the river defence last December (2006), and a section was also damaged by the aircraft that crashedâ, the CEO said. âPart of the delay was also caused as we had to seek additional funding from government, and this took some timeâ, Findlay, a former St. Vincent and the Grenadines, Windwards, Combined Islands and West Indies wicket keeper revealed. âThere were also some problems with irrigation, but we are trying to work that out with the CWSAâ, Findlay, a former Chairman of the West Indies selection panel said. Findlay outlined that part of the corrective measures to ensure a steady supply of water at the Arnos Vale Playing Field, that rain water from the roof of the double decker is being channeled into a storage located under the Scoreboard on the eastern side of the ground. Apart from these drawbacks, Findlay said that the other grounds are also near to completion. âThe Sion Hill Playing Field and Arnos Vale Two are virtually finished grassing, with the football area at Sion Hill finishing up and as you know Stubbs is finishedâ, Findlay stated. When quizzed why the local chapter is still active while ICC Cricket World Cup WI 2007(CWC) 2007 officially closed its operations December 21 last year, the CEO said, âThe LOCâs in the region are all separate companies from Cricket World Cup Incâ. Findlay said that the focus now should be on making the facilities, especially Arnos Vale, a viable investment. âWhat we have to do is to now start to market the ground (Arnos Vale)â , Findlay opined. He said that the venue can be rented out for short term events such as big concerts, as the grass would suffer little damage. Findlay noted that because it is multi purpose, other sports like athletics and football can benefit. The LOC CEO believes that âthe biggest legacyâ left here as with other stadia built or redone across the Caribbean, which staged the Cricket World Cup, makes the event a huge success. Findlay contends that if the refurbishment were not done to Arnos Vale, that St. Vincent and the Grenadines could have been left out of the West Indies Cricket Board international itinerary. With the improved facilities, Findlay said that we can compete with Windwards neighbours Grenada, St. Lucia, and now Dominica for more international cricket matches.